December has been a busy month at Embracia for all our staff, residents, family and friends. Our lifestyle calendar has been jam packed with activities to get everyone into the festive spirit, the count down is on until Christmas. 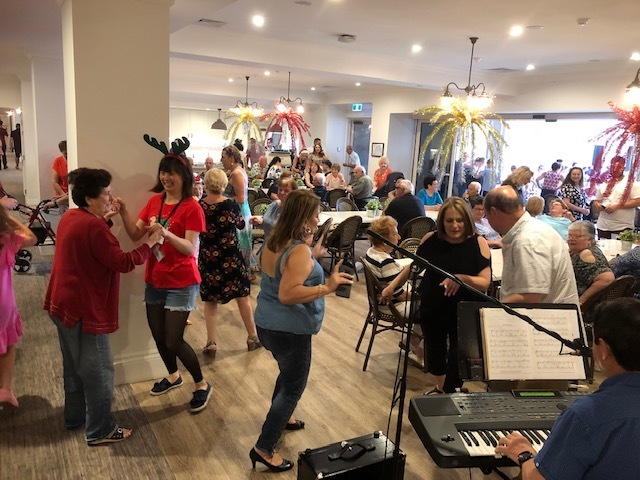 Embracia Moonee Valley got the celebrations off to a start with their annual Christmas BBQ. There was a massive turnout of around 400 people which was lovely to see so many family members and friends getting involved. All guests enjoyed a tasty BBQ with over 1000 sausages cooked on the day. We had live entertainment with Sam Balbo who always gets residents singing and dancing, as well as a visit from Santa himself! 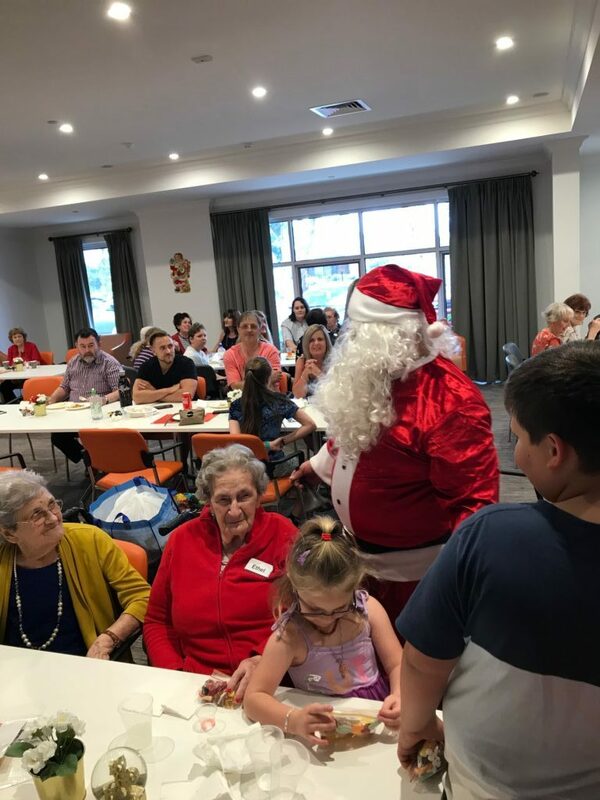 We have also featured a Christmas themed high tea, made Christmas tree decorations in our art and craft workshop and challenged the residents with Santa origami. 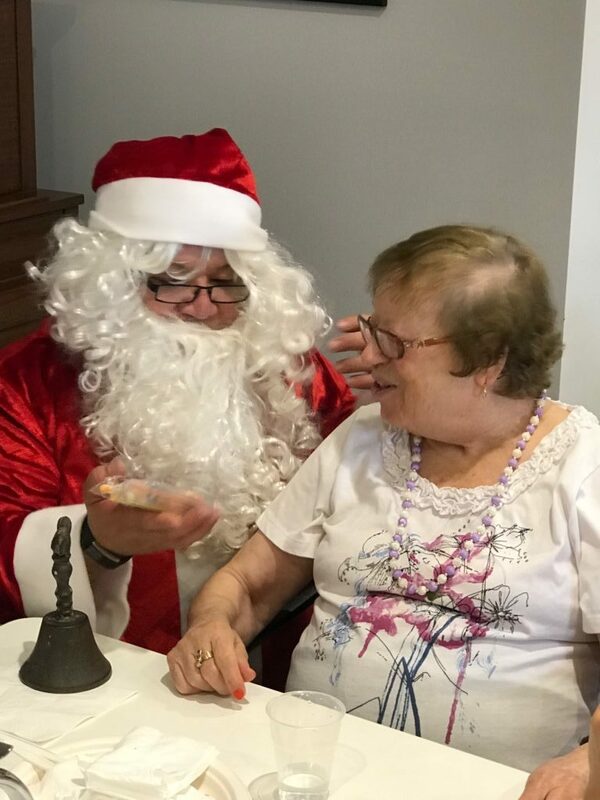 Some of our residents traveled to the East Keilor RSL for their Christmas lunch function, whilst others enjoyed an outing to the Milleara Mall to organise their Christmas shopping for loved ones. Last week we held our resident Christmas luncheon. Cam cooked a delicious Christmas feast, there were presents for everyone and the beautiful sounds of students from prep to grade 6 from St Martin’s De Porres school choir performing Christmas carols. Today at Embracia Reservoir our residents are also being treated to their delicious Christmas lunch. Tonight they will also host their annual carol service with family and friends, which is a highlight of the Christmas Calendar for those involved. We are looking forward to our New Year Eve Happy hour celebrations later this month to conclude another busy year of our lifestyle program in both Moonee Valley and Reservoir. Wishing everyone a very Merry Christmas and all the best for the holiday season, from the team at Embracia Victoria. Embracia Moonee Valley welcomed Cameron Lochhead as their Kitchen Manager only a few months ago, and already he is having a big impact on the dining experience within the home. He leads a team of talented chefs and kitchen hands who together, create a healthy and well balanced menu that is seasonally appropriate and continually changing. Cam has been an integral part of making meal time more of an 'experience' for our residents. Food is such an important part of our residents day, so it needs to not only taste delicious, but be presented in a visually appealing way. Meal time is often the highlight of a resident’s day. At Embracia, our intimate households’ feature lovely dining spaces that give off a warm vibe, a French Provincial ‘home like’ interior in which the meal can be enjoyed. Our kitchen team cater delicious, healthy and vibrant meals for all our residents and their guests. We happily provide choice for our residents when it comes to the menu and cater for a wide range of tastes, preferences and cultural/religious needs. After all, incorporating a well planned menu that provides a balanced diet and a focus on elderly nutrition is key to ensuring our residents are taken care of. Residents living with dementia have a far lower intake of food and fluids due to their decreased recognition of hunger and thirst. Their sense of taste and smell is reduced, and difficulties with swallowing may also arise. Our kitchen staff serve custom modified dishes that fully enhance the aesthetic appeal of all our served meals, regardless of the resident’s cognitive abilities. The dining experience needs to encapsulate taste, aroma, colour and texture- so presentation of food is of paramount importance. After all “we eat with our eyes’. We have introduced the use of hot steaming face washes soaked in an orange citrus essential oil for residents to freshen up before their meal. Residents have loved this new routine, it has had a great impact on stimulating their appetite and providing a positive association in preparation for meal times. In these memory support households our expert staff use verbal communication and non verbal gestures that focus fully on the individual. Everyone has a different way of savoring their meal, with some residents preferring to chat between mouthfuls, some love a truly peaceful and silent dining experience while others like to observe their friends eating their meals whilst being assisted with their own. Meal times are equally important for social interaction within the household. At Moonee Valley we have recently introduced a ‘Food Focus Group’ which is held every second Friday in the Men’s lounge. This group is facilitated by our wonderful volunteer Amilia, and is a wonderful way for residents to give constructive/positive feedback on the food, menu ideas and suggestions. The focus group also decide what cooking group sessions will be held for the month. Most recently in November, the cooking group made Krispeli Italian donuts, Anzac biscuits and Firatelli Italian Waffles. This is a great way for residents to give their input into the lifestyle program based on what interests them, and leads to greater attendance and involvement in activities around the home. Cameron started his career 18 years ago in a Spanish restaurant in Fitzroy. He learnt a lot of his core values in his time at this restaurant, in particular the skill of time management. From here he expanded his horizons and worked in a French fine dining bistro in the CBD where he completed his qualifications to become a qualified chef. Cam has also spent 5 years working in Canada, New Zealand and London. In this time he had many interesting experiences including living with a British celebrity chef, meeting his wife, and even cooking for former British Prime Minister David Cameron at his residence at 10 Downing St. A career highlight that he will always remember. Given Cameron’s extensive experience overseas and in international restaurants, he likes to incorporate these influences into the menu to give our residents a taste of food from all over the world. “I enjoy continually updating the menu and including dishes from different origins of the world. This upcoming menu will feature ,more dishes from abroad (Asian and Middle Eastern for example) while also balancing our main demographic of European and Mediterranean residents”. We asked Cameron about special events throughout the year that are related to food. He replied, “having a great relationship with the lifestyle team really helps when planning for special occasions. With Christmas only around the corner we have a few special events centered around that, then Australia Day will be the next on the calendar where we will host a BBQ for the residents”. Finally we asked Cameron what his favourite part of the job is, Cameron smiles and says “The residents are the main reason that I am here. My favourite aspect of the job is talking with the residents and finding out about their background, culture and upbringing. I love getting their constructive feedback and suggestions on our meals. Hearing about what types of food they were brought up on and how they would gather for meal times throughout the year with family for special events and more traditional/religious times of the year”. Our kitchen team at Embracia always encourage feedback and suggestions on the food and our menu. We love to hear about the meals that you particularly enjoy! You are also welcome to share a meal with your loved at any time for a small nominal fee. Just provide Catherine at reception a day’s notice for catering purposes, and she will happily organise this with the kitchen for you. 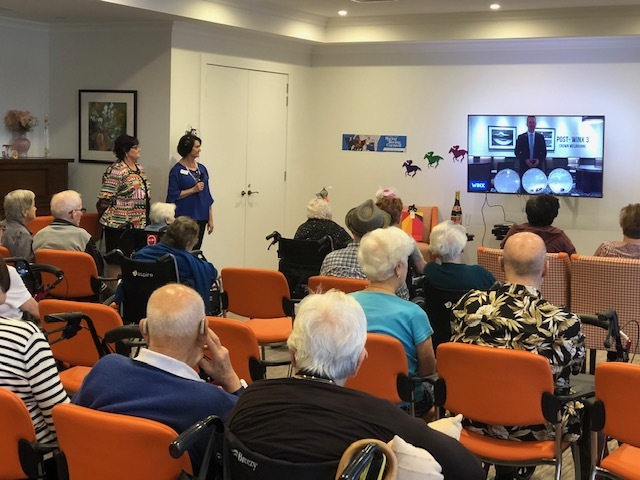 Another Cox plate, another Winx win…..and another jam packed Spring Racing Carnival for our residents! At Embracia we are always looking for ways to help add meaning to our resident’s lives and bring both fun and relevant entertainment into our homes. We keep our lifestyle program varied and interesting, and most importantly try to keep our residents connected with everything that is happening in our local community. It’s not only about helping residents reminisce about their past, it’s also about connecting with the present. Being only a stone’s throw away from Moonee Valley Racecourse, our home is always abuzz during Spring Racing Carnival, and this year has been no exception. Embracia Moonee Valley has embraced the rich history of horse racing in the area and has had a strong connection with the Cox Plate in particular. In fact, being a local facility, all our households have been named after Cox Plate champions from both today and yesteryear. Our households include Phar Lap, Manikato, Young Idea, Chatham, Kingston Town, Tulloch, Northerly and after the present champion racehorse Winx. 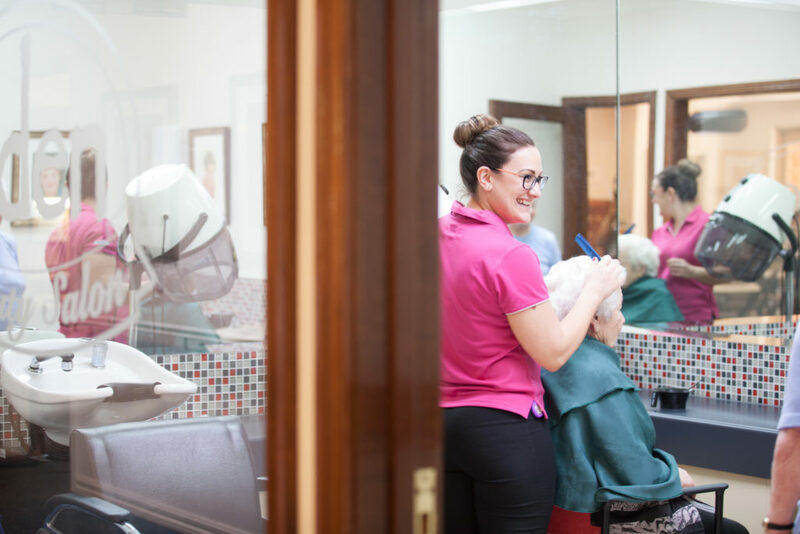 Even our cafes are named after champions Black Caviar and Carbine, and we have Makybe Diva and a So You Think hair salons to pamper our residents. Needless to say, we have embraced the history of Moonee Valley and our residents and staff always love this time of year. 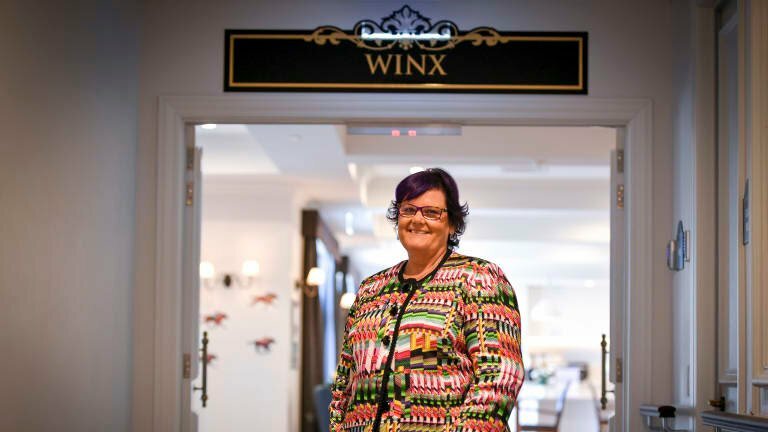 Our Spring Carnival celebrations have been extra special this year with a visit from part Winx owner Debbie Kepitis in the lead up to the Cox Plate last week. Debbie shared her story with residents, family members and staff about Winx’s humble beginnings. She knew that Winx was a special horse, “the first Cox plate was the thrill of being in it…and to win an unbeatable record was amazing…(Winx) won against top class horses”. That still gives Debbie “goosebumps”. She continued to state “Winx has won 3 of the biggest races in Australia year after year…and …all of the races are (her) favourite”. She cannot pick one. Winx is a special horse because “she loves to race…she has the fire in her”. Debbie gifted Embracia a copy of the book written by Andrew Rules “Winx: The Authorised Biography” for residents to enjoy. A big thank you to Mark Dodemarde who made Debbie’s impromptu visit possible and to Helen Dodemarde for orchestrating it all. It has been a jam packed Spring Carnival for our residents as we now head into the Melbourne Cup next week. Earlier in the month some of our residents went on an outing to the Moonee Valley Racecourse and enjoyed a beautiful lunch at the Legends’ restaurant. Residents were able to enjoy not only a great meal, but the history and ambiance of the racing environment. Then it was a fascinator workshop where ladies and gents had fun designing and creating their own fascinators to be worn throughout the carnival at the various events being hosted by Embracia. On October 25th we held the Cox Plate Social. Residents dressed up in their best outfits and wore their hand made fascinators. They reminisced about such events, sharing stories, singing and dancing as they would have done during socials in their heyday. Laughter and joy filled the room for residents and staff alike. Many of our residents met their partners at such events so it’s a wonderful time of year for all involved. On October 29th we were lucky enough to have yet another guest speaker visit us, Colleen Bamford, part owner of champion racehorse Americain. 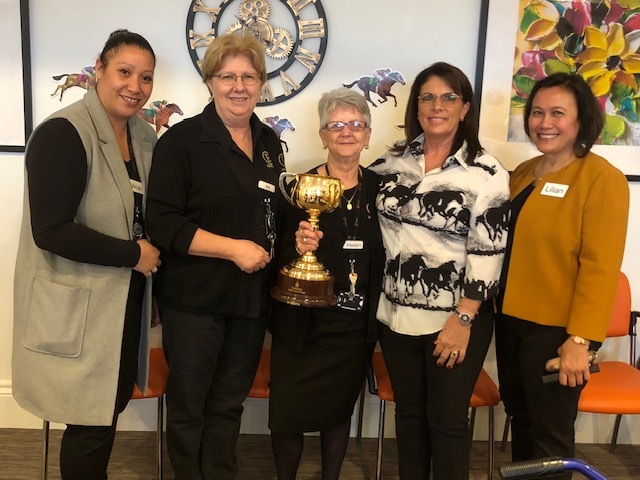 Americain won the Melbourne Cup in 2010 and the Cox plate in 2011 and Colleen shared with our residents her story of purchasing Americain in France and his journey to winning the Cup. Our residents were further delighted that Colleen brought in the Melbourne Cup, many having their photo taken with it for good luck. Colleen was extremely generous with her time and our residents really enjoyed hearing her story. Coming up later this week we have the Melbourne Cup Social and a Cup sweep to conclude our Spring racing festivities for 2018. Follow our Facebook page to join in on the fun and stay up to date with what is happening in our homes. At Embracia we host a diverse range of activities designed to create a sense of purpose and joy in the lives of our residents. The most popular activity in our program is 'Exercise with Karina'. This class is a gentle daily movement class that helps residents to get the blood flowing, ease aches and pains, have a little fun and feel more connected to others in their community. The class started as a weekly event at our Moonee Valley home in February this year, but has since become so popular that Karina now hosts it at our Reservoir home as well. It is attended by between 15 to 20 residents each day and is particularly suited to those who want to nurture their physical, mental and emotional well being. Karina Sproal is our in house physiotherapist at Embracia, she works between our two homes in Moonee Valley and Reservoir. We have recently recruited Yongmin as part of her physio team to meet the growing demand from our eager residents. 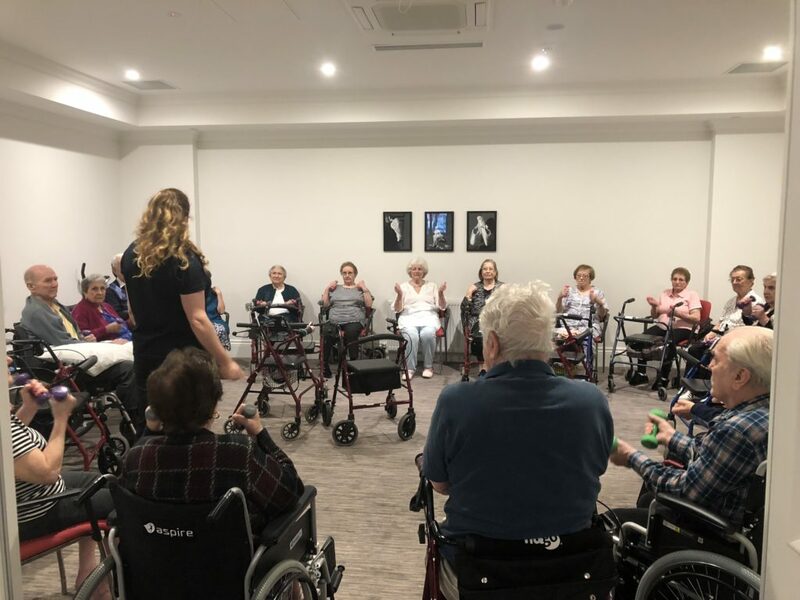 The exercise class can be combined with our physio or massage services, but the residents who do participate are finding that “Exercise with Karina” relieves the need for extra bodywork. Karina is a gentle but enthusiastic teacher. She is passionate about keeping residents as independent as possible and has built a devoted following. Residents that take her class have reported back a wide range of physical and emotional benefits which is so pleasing to see. Everyone in the class is treated individually, Karina adapts the movement patterns for attendees with any physical disabilities and encourages extra stretching for others. The goal is restoring independence without pushing too hard, so residents get to feel that they are still able to do things for themselves. Encouraging physical well being was the original intent of the class, but Karina’s students have found the benefits go far beyond this. Easing physical discomfort is her specialty and she has seen her students gaining strength each week. Building strength enables residents to walk independently and reduces the likelihood of falls. The social and emotional aspects of Karina’s classes are what really warm our hearts. We’ve seen isolated residents come out of their shells to have a laugh and connect with a sense of freedom and happiness again. The simple regular practice of movement has an incredible effect on the brain, and over time, the physical side of it becomes a secondary benefit. For Karina, the joy of teaching is more than just seeing the benefits of the physical therapy. She loves talking to the residents and being able to make their day special. She understands that they get more out of this simple connection than they do from having a massage or one on one physio. She says that just being there with the residents and watching them have fun is a terrific experience. Families often request that we make sure their loved ones come to the class, and our staff are happy to help. We’ve had residents with dementia not only share that they remember the class, but that it makes them feel happy. This is what gives Karina the most satisfaction, and it has inspired her to offer walking groups and Pilates classes for the residents of Embracia in the future. If you would like to hear more about what we offer our residents at Embracia, feel free to contact us or book a tour of one of our homes today. These days, aged care facilities are very different from what they once were. Nursing homes used to be known as dull institutional environments, but all of that has changed with new attitudes and higher standards of care at nursing homes such as Embracia. After years in the industry, our goal was to create an environment where your loved one will want to spend time while we help you share the load of care. With conveniences like an onsite hairdresser, a GP hub with a suite of visiting allied health professionals, great café coffee, a wellness centre and even church services- our residents have everything they need at their doorstep. Embracia residents and their families are often surprised at the sense of community and fun we’ve created in our homes. Enjoying life is so important for mental, physical and spiritual health, we see creating laughter as a vital part of our care system. Everyone has different needs, but the key is finding out each of our resident’s ‘wants’ and making sure there’s something fun on offer to meet them. Each month our dedicated lifestyle team create a programme based around our residents’ interests, which sees them having more fun than those half their age! From chick flick nights to physio led pilates and even a Star Wars Day! With many different activities, residents can pick and choose the things they would like to participate in each day. 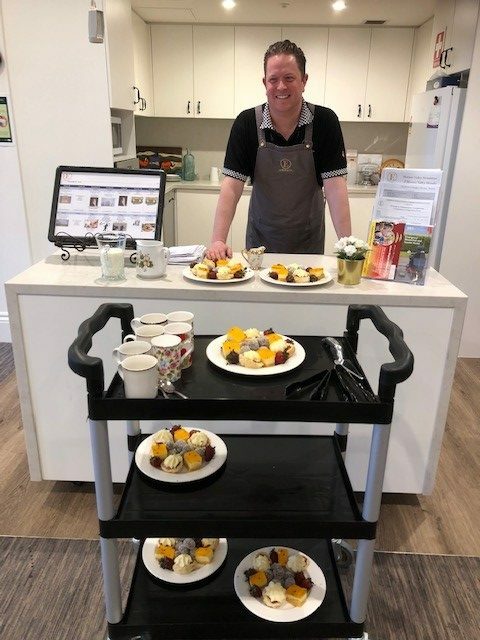 We find the energy levels of aged care residents change frequently, so we make sure there’s always a soft option to cater for residents having a tired day. Here’s a list of our resident’s top five choices. Cacti planting – Such beautiful self-reliant little plants we love helping residents to plant cacti and succulents to create small gardens of their own. Chick flicks – It’s all giggles and bonding with our chick flick specials. Think warm cups of tea and reminiscing. Residents head to bed each night feeling connected and close to their friends in the community. Mindful painting – Sometimes dexterity can be a challenge, so we focus on enjoying the process with mindful painting practices that resident’s find very soothing. Bocce – A gentle ball sport that’s a bit like boules. It’s very social and even challenging. You’d be surprised and who’s topping the Bocce leader board each week! Happy hour – The highlight of the week on the resident’s social calendar. Happy Hour is always a full house where residents have a chance to relax, enjoy a drink and each other’s company. We are proud to offer such a fun and varied program of regular activities at Embracia. We invite you to book a tour of our home today where you can witness the fun firsthand and decide if Embracia is the next home for your loved one. At Embracia we are not just about providing for our elderly and taking care of their needs but also creating a culture that encourages others to join us. Our volunteer program brings many benefits for all involved, and not just our residents. Improving overall health: The benefits of frequent interaction are well documented within the aged care community, thus Embracia’s proactive approach to fun, fresh activities that keep the days interesting for our residents by our staff. However, when combined with volunteer contributions, both residents and volunteers alike benefit from each other’s company and have plenty to gain from an intellectual and even spiritual level, which is a great boost for their health. Making Connections: Getting to know new people is always beneficial for mental well being, allowing you to step outside your comfort zone by interacting with someone of which you may not normally come into contact. For the residents it keeps their days from being too repetitive and enables their minds to continuously come into contact with new stimuli. 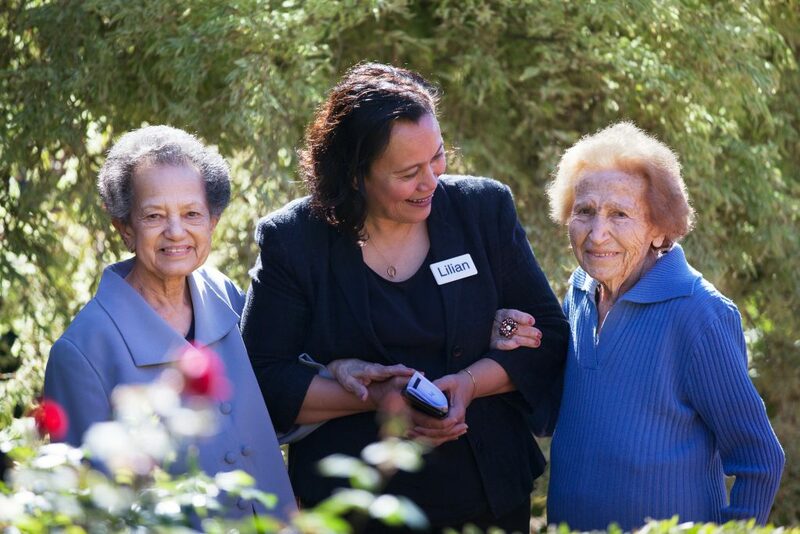 Volunteering in Aged Care keeps residents feeling connected to the community and the world outside of an Aged Care facility. Remember volunteering in aged Care takes many forms from visiting an individual; organizing entertainment in a residential facility to assisting with any of the organizations that provide services for the elderly. Explore the options and find out what might suit you and fit in with your interests and other commitments. A little time goes a long way: Volunteering only requires a small portion of your week as you’re able to volunteer for as little as a few hours at a time or volunteer daily. All of it is appreciated and highly beneficial to our residents. With numerous benefits both physically and mentally, it is an opportunity to give back to those that have given us so much. Those that have helped shaped the world we live in today and reap all the benefits of their hard work! It’s a tremendous privilege to not only spend time with residents but hear so much about their life stories. Activities: Keeping active with different activities in Aged Care facilities, excursions, learning new skills or building on existing ones, as well as boosting your self-confidence and satisfaction. Mental Health and Well Being: Volunteering is something that rewards you, not monetarily but internally. There is clinical evidence that helping others combats our own depression and can bring meaning to our life, relieve stress, and make us feel valued. Not to mention the social aspect, human beings must have social interaction. Imagine all the stories you would hear; real life memories, and experiences, potentially from all over the world; from an individual older than you. The journeys and lives they’ve lived that you get to hear first hand. Puppets Alive made a fun filled visit to our residents at Embracia Reservoir this month, and boy were they entertaining. Puppets Alive offers both amusing and engaging performances that include a history of puppetry, well known songs and fun loving puppets that interact with the audience. We chose an Italian theme for our performance. Residents just loved singing along to the classic Italian songs and Mario Lanza (as a puppet) was a particular hit with the ladies! 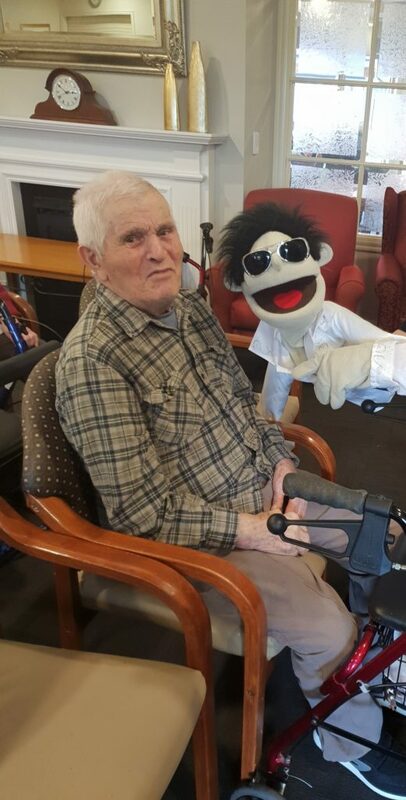 Stephen the puppeteer has over 15 years experience working with puppets and entertaining in aged care homes across Melbourne. 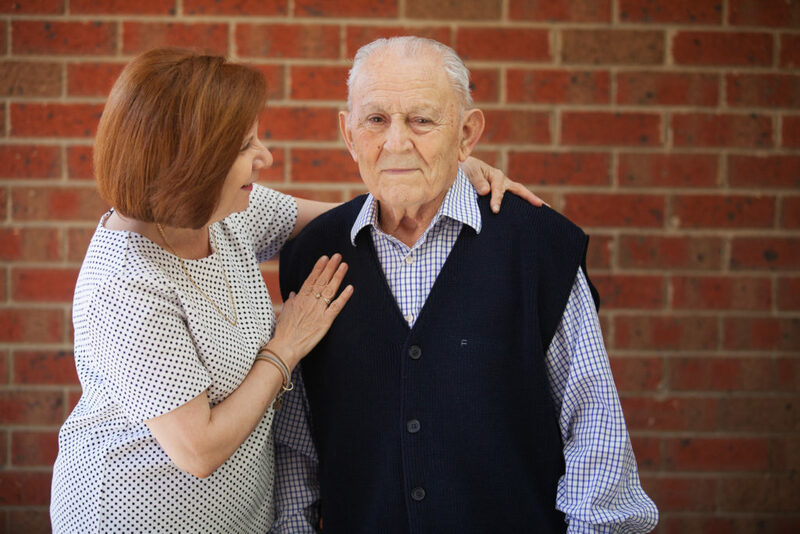 He has completed a course in understanding dementia and has vast experience in aged care that enhances his interactions, in particular for those living with dementia. As well as providing great entertainment, Puppets Alive also donate a portion of their fee to Dementia Australia. Thanks to Stephen and Puppets Alive for giving our residents such a laugh, we can’t wait for the next performance! Meet our wonderful lifestyle team, Eva and Helen from Embracia Moonee Valley and Michelle from Embracia Reservoir. These ladies are all extremely passionate about their work in aged care and enrich the lives of our residents on a daily basis. 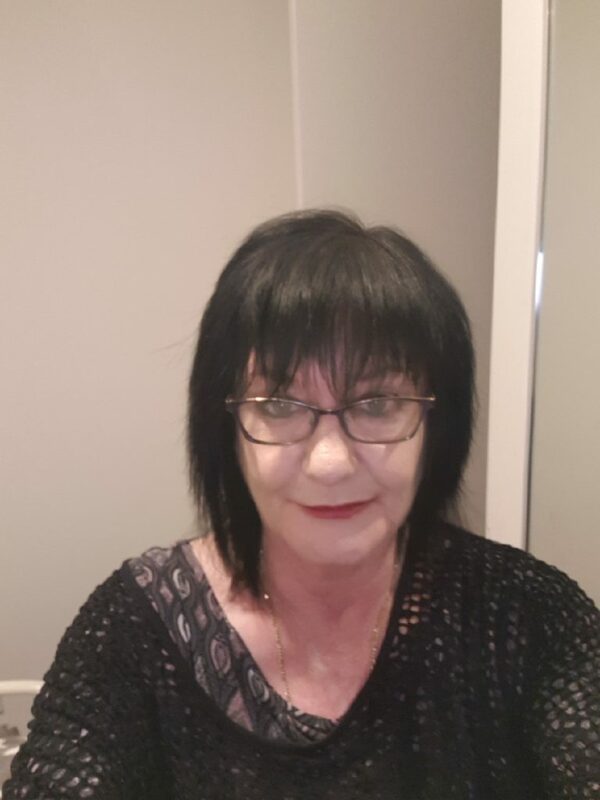 Michelle is passionate about the Eden Alternative which we practice at Embracia “personalised care, I know all the resident’s likes and dislikes…they are like my extended family”. Michelle maintains that the culture is strong at Embracia due to the amazing student program that we run. Most of our staff were past students of the program so they understand Embracia’s philosophy and values, combine this with a strong sense of family involvement in our homes and you create a warm and friendly environment. All of our lifestyle staff have grown up in the northern suburbs and are active members of the local community. The program these ladies provide our residents is varied, creative and interesting and aims to bring the outside community into the home so that our residents can feel a part of current events. These ladies work tirelessly to tailor a program that suits the residents needs and is aligned to their interests and passions. Thank you to our wonderful lifestyle team for everything you do for our residents, keep bringing the fun to Embracia Aged Care!